Scirpus is a sort of one-year and perennial plants belonging to the family of Cuperaceae. 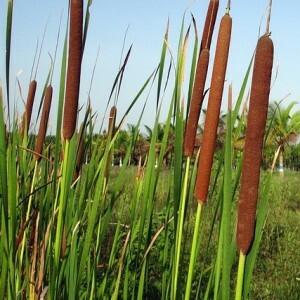 These plants live in coastal part of reservoirs or in the water. It should be noted that often the Cane call plants which actually don't belong to the sort Scirpus. Representatives of the sort scirpus are widespread on all continents, however preference give to temperate and subtropical climate. The scirpus is a tall plant, cylindrical or which trihedral upright stalk in height usually makes 100-250 cm. The scirpus has no the full-fledged leaves departing from a stalk, and represents only extensive coastal thickets of twigs. The plant can be often shipped in water. The plant has a long creeping rhizome and small flowers (in the form of cones) light green, and by the end of blossoming – brown coloring who are brought together in inflorescences about 10 cm long and blossom in the middle of the summer. Cane. Cane variety. Cane cultivation.